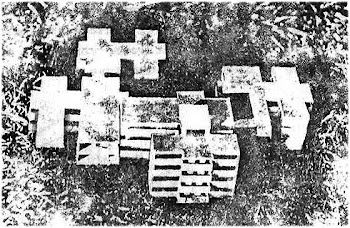 1982: Development of Building Design Techniques in Cuba. Paper read at the Second Congress of the Latin American Association of Industrial Design (ALADI) held in Havana, Cuba, from 8 to 11 December 1982. Author: Reinaldo Togores Architect. Project Management Specialist. In a country where construction is being industrialized, developing building projects increasingly approaches industrial design. Hence we consider the Cuban experience in this field as an appropriate subject for a paper to be read at this Second Latin American Congress of Industrial Design. Starting point must be the times of the revolution's victory, January 1959. There were then almost nothing more than small private offices engaged in the development of projects, mostly for middle and upper bourgeoisie residences. Many of these professionals, being also small-scale entrepreneurs considered themselves affected by the transformation process undertaken and instead of collaborating in peasant housing, rural hospitals, schools and industrial plans that were then initiated, chose to leave the country on the trail of their former clients. As a consequence, our mass of specialists is now very young. However, the construction industry output is now six and a half times higher than in 1958, around 1,300 million pesos. Dealing with this building construction plan with a technical force composed mainly by recent graduates has required the development of a number of resources to ensure an adequate level of quality in projects and contribute, in turn, to increased productivity . We refer to them below. Design always involves a solutions seeking process. The set of possible alternative solutions may be more or less numerous. The designer explores as many alternatives as circumstances allow. This search usually has an orientation defined a priori from considerations related to the construction technique, the destination of the project, economy and other issues of various kinds among which is the designer's aesthetic evaluation criteria can not be neglected. Standardization and typification are particularly important as means to ensure proper orientation to this search for solutions. Thanks to them, an accumulated wealth of experience that can save traveling on sterile directions is made available to each and every designer. According to the type of projects to be developed, it will be possible to sort the information obtained from previous experiences for its use on future occasions. This information, selected and sorted according to the priorities of the country's technical and economic policy at a given moment of its development, assumes the form of a standard. In some cases, the standard may be derived from scientific research designed for this purpose and usually involves searches within the available literature that complement and enrich the experience of the experts in charge of its preparation. The standard ensures quality and economy in the methods, materials, components and solutions used in the project and is, simultaneously, an ideal vehicle for the integration of the scientific and technical progress achievements. Although the standardization activity for the construction sector in our country dates back to 1963, its effectiveness in our industry has suffered from a number of shortcomings, among them the lack of standardization bodies and services within the building design entities, the insufficient number of approved standards printed, their uneven distribution and the lack of procedures that allow verifying their implementation. These aspects were taken into account during the restructuring of the Ministry of Construction's entrepreneurial system in the late 1980s. Since then specialized bodies for standardization and quality control at the enterprise level were established, the process of monitoring compliance with standards and quality of the solutions adopted in the typical and specific projects whose importance warrants it through experts committees was established. And the fund of existing rules was expanded by creating project regulations, branch policy documents whose preparation and approval process is more agile than that of state standards, enabling a more consistent response to the mutability of conditions derived from actual practice. Typification has made for concrete results in relatively short periods of time. If through standards we universalize the experience acquired extracting from it those principles of a general validity, typification allows us to reuse the best design solutions found, saving us from repeating the same process of generating the possible variants, selection and assessment of those that meet the parameters set in the program. This allows to achieve a considerable increase in the designer's productivity without adversely affecting the project's quality. The practical use of these possibilities will be directly related to certain characteristics of those typical solutions offered. These solutions, whether for full functional units, for functional components or for basic building elements, must be conceived in terms of systems and subsystems that have a large number of combinatorial possibilities. The development of these solutions requires processing in such a way as to ensure compatibility and interconnectivity according to modular principles of units that are functionally effective and technologically complete. 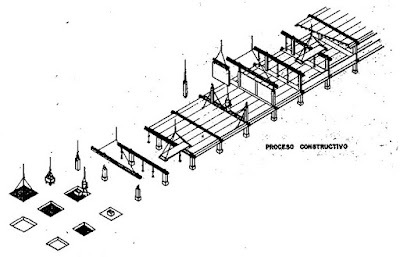 In Cuba, typification has operated at different scales and for various purposes, including volumetric diagrams, functional diagrams, construction techniques and systems, isolated building elements, building unit modules and sections and complete buildings. Typification has been instrumental to the mechanization and industrialization that have been the salient features of Cuba's building industry since 1959. The most spectacular way results can be seen in terms of school buildings, with over 500 schools and school complexes with capacities between 500 and 4,500 students built during the 70s. This stunning result was made possible by the typification of a construction system -the Giron system- and the development of typical projects like the junior high schools in the countryside, kindergartens and primary schools and the design of large school ensembles from typical buildings and building sections combined according to functional diagrams characteristic of the various programs. The production of catalogs and designing from them has been a logical development of typification. Catalogs are structured in a way that replaces a large part of the documentation that would otherwise have to be prepared for each project. The success of this method lies in the way of grouping the documentation, depending on the level of generality of the solutions and according to the requirements of the construction process. This is true to a large extent in the major building systems in use -Girón system, sheds, industrial warehouses- which have complete catalog sets that include components, joints, typical details and instructions for the design and construction. Catalogs of functional schemes, technological flows, etc. have also been developed for various specialized programs. There are plans for publishing catalogs pr the typical projects series, so that the project of each building is composed from a number of catalogs of parts of the project, grouped according to the different stages of execution of the work. Each of these catalogs, in turn, will refer to the detailed constructive solutions in a parallel series of catalogs that apply to the entire system of typical buildings in question. Today, the most advanced project development techniques are certainly those based on the use of electronic computing machines. The Automated Design Systems (Sistemas Automatizados de Proyecto - SAPRO) make it possible, in principle, to store and process information, automatically generate design solutions and check their quality. The disappearance of the drawing board and the traditional paper and pencil techniques can be now foreseen. Domestic production of computing means, coupled with the importation of a number of machines of different capacities, have made computation services that can be used for design available to the project development entities. These services are now applied mainly to isolated engineering calculations. The implementation and completion of programs for roads, hydraulic, electrical and structural design is included in the current planning. Truly comprehensive systems -especially those intended for architectural design- although they would make a more efficient use of computer technology and specialized personnel operating them possible, are not easy to implement and require specialized peripherals that due to their high cost are still scarce in the conditions of our country. Its development can not be undertaken indiscriminately for each type of project will require a configuration of equipment according to its specific characteristics. For the housing design agency, for example, a photographic copying method for the production of the project documentation has been recommended, making it possible to dispense with a digital plotter output. Another aspect of the question is related to the development of the database and the programming required to fine-tune these systems. The implementation of SAPRO requires a high level of development of standardization and typification. Without this there will be no data for the machine to process or design rules according to which that information is to be processed. In Cuba, the large state construction plans, where prefabricated systems are used for works of great complexity such as industries, hospitals, research centers, urban complexes, etc., create now optimal conditions for an efficient use of computer technology applied to project development through integrated systems whose study has already started. 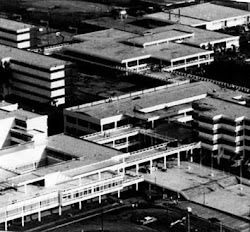 The design organizations of the Cuban construction sector and, in particular, those belonging to the Ministry of Construction, have managed to meet the demand for projects generated by the massive building plans launched since 1959 through the development of non-traditional design techniques. Typification has been a particularly important factor and it has manifested itself especially in the development of prefabricated building systems among which we mentioned as an outstanding example the Giron system, designed in 1969 in response to the school building plan. This system has been used in some of the most significant works of contemporary Cuban architecture. In our case, standardization, typification and project development techniques associated with them have not been negative factors for the functional and aesthetic quality of the resulting designs. Rather, they have contributed, introducing a rigorous discipline in project design, to the training of designers capable of developing projects well resolved from the functional point of view and with a formal quality that, as a whole, is the most successful in our building industry's history. Dormitory variant designed using catalog project components. Authors: Arch. Ma. del Carmen Rodríguez, Eng. Williams Calderón. School complex designed using Girón System standard components.